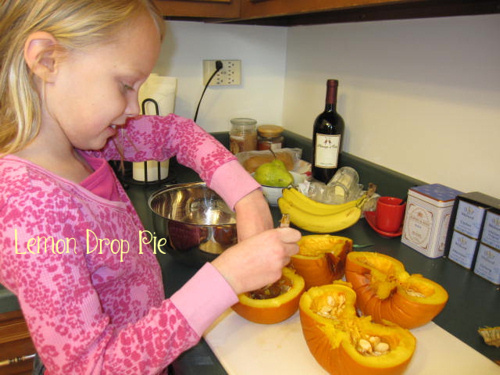 This year, Lily, Emmy and I decided to bake a pumpkin pie using real pie pumpkins instead of pumpkin from a can. 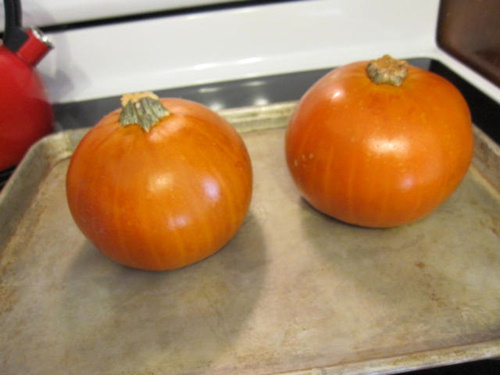 Whole pumpkins, baked for 40 minutes at 375 degrees. I just love their color! Lily enjoyed scooping out the pumpkins seeds! 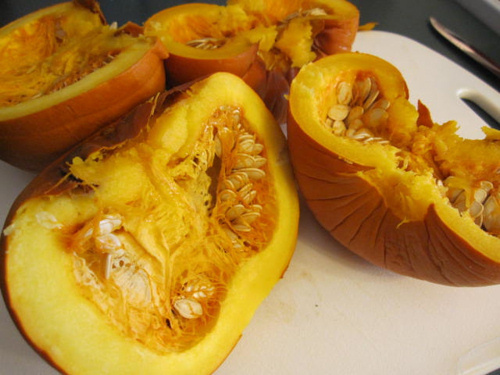 The skin peeled off of the baked pumpkins very easily! 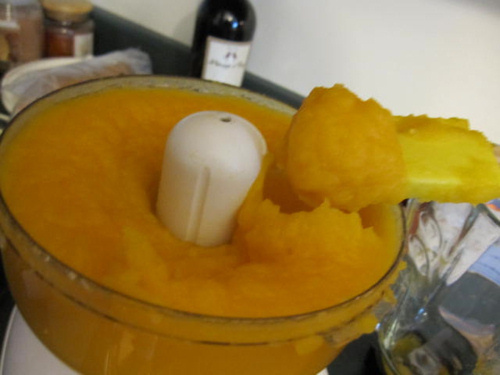 I pureed the pumpkin in a food processor attachment that came with my blender. After I pureed the pumpkin, I made pumpkin pie as usual! Delicious! 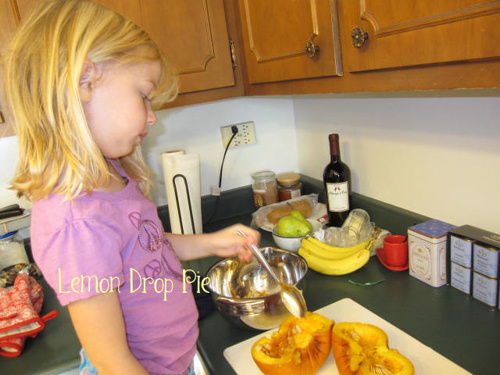 Have you made fresh pumpkin pie before? You know, I never knew it had to be baked before you got the insides out! Looks yummy! Beautiful! 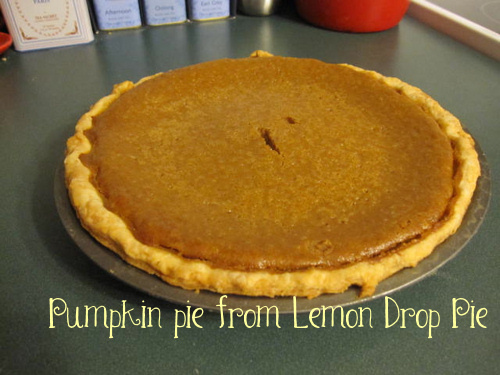 I love pumpkin pie but I also love every other kind of pie. . .it's a problem! Way to go! I almost did that this year and then I changed my mind. Maybe next year! oh that looks so delicious! i too love the color of that baked pumpkin! my aunty makes pumpkin pies from fresh pumpkins every year. it's one of the things i look forward to at thanksgiving! she usually bakes a whole pie just for me to take home because she knows i love them so much! mmmm! You've inspired me to do that too! Probably not by Thursday, but you know…I'm glad it was just as delicious as always! We're going to make our first fresh pumpkin pie this year. We'll be cooking our pumpkins in the crock pot, though. Yummy! That looks really delicious, I think I'm going to give it a try as well, it doesn't seem to be too difficult to prepare. Thanks for the inspiration! No, it was actually pretty easy. Just a little time consuming, but we had fun! It looks really nice. I am hungry now! I wish I could give you a piece! My attempts at pumpkin pie started in the can and ended in one. The trash can. Maybe I should've been using the fresh stuff! The two pumpkins sitting on my front stoop look very nervous right about now. I am a mutant who does not like pumpkin pie. But I imagine this one tasted better than using canned pumpkin. You are so industrious! Thank you for the tip of baking the pumpkin first — and setting some aside specifically for this purpose. 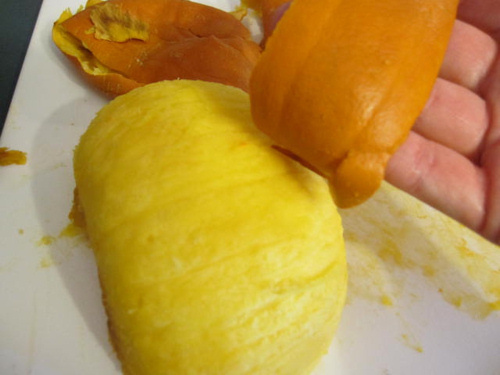 Last year we made pumpkin cookies from the innards of our jack-o-lanterns. It was tough getting 10 oz. of innards for the puree, but they turned out yummy. Didn't last long though — they spoiled before we could eat them all! I have some leftover pumpkin, so I was thinking about making pumpkin bread with it. Cookies sound great, too!